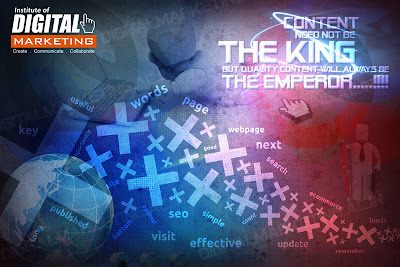 Quality Content will always be the Emperor.....!!!! Purpose: Whenever we intend to prepare the content be it a website, article or book, research paper etc we need to know the end Objective of it. What Goal are we going to achieve from it. e.g. To have rich, original, Novel, Interactive (visual+audio) Collaborative Content of vital use for our customers on continual basis for our portal. Target Audiences: for whom the Article/content is being written. Begin with them in mind. · Digital marketing product and services companies. · Interns and Summer trainees for their ongoing projects. This acts as the data bank for our content plan, It may consists of Books, ebooks, newspaper articles, magazines, online articles etc. List content to be included in your Web site. For each content item, identify the source for the content. This may include specific documents and/or individuals within your organization who will prepare/create the content. List interactive features/forms to be included in your Web site. For each item, identify the person(s) within your organization that have information needed to create the interaction. What will make companies & consultants, freelancers submit their details to our website? 2. getting the existing people who share all over internet globally on various websites to share and upload their contents with us. Outline of content to be included in our Web site. Main headings in the outline should correspond to groups of content that should be available from the home page of our Web site.